One of the most popular pre-workouts is Pre JYM. It's designed by Dr. Jim Stoppani, who has a PhD in exercise physiology and minor in biochemistry - so you would expect the ingredient and doses to be clinically-backed. Pre JYM also doesn't contain any proprietary blends or concentrates. You know exactly what you're getting when you take a dose of Pre JYM - which is always a good start! To find out whether Pre JYM lives up to the hype, we wanted to review it in more depth. How does the ingredient list compare to other PWOs? Are the doses backed by scientific study? And is it worth the relatively high cost? Keep reading our Pre JYM review to find out. Where Can I Buy Pre JYM? Is it Ever On Sale? The goal of Pre JYM is to apply solid nutritional science to the field of pre-workout supplements. It's suitable for both women and men, and aims to boost workout performance and speed up progress. It's far from the only pre-workout with these claims though. So, what makes it different from others on the market? The first thing that stands out is the excellent doses of each ingredient. Many supplements severely under-dose the most important ingredients, which means you don't get all (or any) of the benefits. This isn't the case with Pre JYM. Each ingredient also has real science behind it. Lower quality supplements often include questionable ingredients to pad out their labels. Pre JYM avoids these and sticks to ingredients backed by solid science. 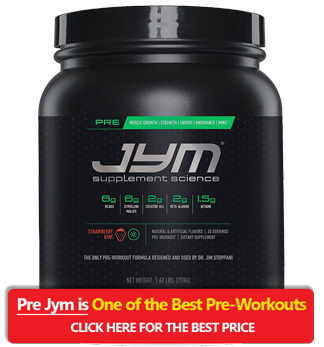 A drawback to the generous doses is that Pre JYM is relatively expensive. There are pricier options on the market - 4Gauge and Legion Pulse both cost more per dose - but it's at the higher end of pre-workout supplements. With this price in mind, we were intrigued to find out whether Pre JYM's ingredient list justifies the cost. 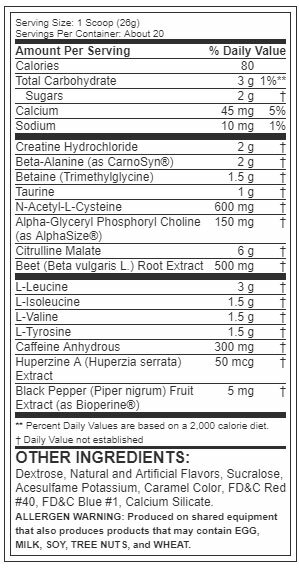 At first glance, PreJYM has an impressive ingredients list. There are 13 "active" ingredients, including citrulline malate, BCAAs, caffeine and betaine. This is considerably more than the six ingredients in Legion Pulse. More ingredients doesn't always equal a better pre-workout supplement though - especially if the ingredients are under-dosed. Fortunately, Pre JYM doesn't suffer from this problem. The doses are generous and largely within clinically-backed ranges. This is essential for a premium supplement, as there's no point paying for an under-dosed composition. We also like that there are no proprietary blends. Hidden ingredient quantities are a pet peeve of ours, so it's great that Pre JYM has transparent doses. Citrulline Malate (6000mg). Citrulline is one of the most important pre-workout ingredients, as it encourages nitric oxide production more effectively than supplementing arginine. This has multiple effects, including a boost in muscle endurance, stronger pumps, improved aerobic performance and a reduction in muscle soreness. The 6000mg dose in Pre JYM is within the clinically backed 6000-8000mg range. BCAAs (6000mg). BCAAs probably aren't as effective at increasing strength and muscle growth as often claimed, but they can certainly help improve your workouts - especially if you're training in a fasted state. Pre JYM contains a large 6000mg dose of BCAAs in the study-backed 2:1:1 ratio. Creatine HCI (2000mg). Creatine can improve endurance, muscle growth and cognition, which is why it's common in pre-workout supplements. In fact, it's one of the few supplements that's proven to directly affect the speed of muscle growth. The 2000mg dose is low if Pre JYM is your only source of creatine, but fine for a pre-workout supplement. Beta-Alanine (2000mg). Beta-alanine is an amino acid that affects the amount of carnosine in muscles. Supplementing it increases muscular carnosine, which can reduce fatigue and improve workout capacity. The dose of 2000mg is lower than we would like - especially compared to the 4800mg in Legion Pulse - but it's not severely underdosed either. Betaine (1500mg). Betaine has been shown to boost muscular endurance and strength, so it's a great ingredient to have in a pre-workout. The 1500mg dose in Pre JYM is on the lower end of the clinically studied range - we would have liked it to be at last 2500mg. To be fair, JYM's post-workout supplement also contains 1500mg, which would bring the total dose to 3000mg if you took both - and there is evidence that splitting betaine into separate doses enhances the effects. L-Tyrosine (1500mg). Tyrosine is an amino acid that assists in the production of certain hormones, including dopamine and noradrenaline. Taking it before a workout may improve mood and cognition, so it's a useful bonus - although we don't consider it an essential ingredient. N-Acetyl L-Cysteine (600mg). This ingredient is less common in pre-workouts, but may help the body maintain its amino acid profile during a gym session. We're not convinced it has a big effect on your workout, but it won't do any harm either. Beta Vulgaris (500mg). Beta Vulgaris, also known as beet extract, is another nitric oxide production booster. This dilates blood vessels to improve performance and generate a stronger pump. There's also evidence that nitrates help the body generate more ATP which can enhance endurance. Caffeine (300mg). Caffeine might not be the most exciting ingredient, but it's amongst the most effective for boosting energy and endurance. Pre JYM contains a huge 300mg dose, so it'll provide a sharp boost - but with more chance of side effects such as jitters. The reason for this high dose is that some studies have suggested 300mg can increase nitric oxide production. If you don't like the thought of taking this amount of caffeine, the Post JYM supplement may be a good alternative. Alpha-GPC (150mg). Along with caffeine, Pre JYM's "focus" stack includes Alpha-GPC. This ingredient can improve mood and focus. Other ingredients include 50mcg or Huperzine A and 5mg of Bioperine. The latter may help your body to absorb the other ingredients for maximum effect. An ingredient we would have liked to have seen is L-Theanine. This amino acid isn't a game changer, but can help take the edge off caffeine - especially as Pre JYM contains such a large dose. Overall, Pre JYM contains an excellent set of ingredients at clinically backed doses. All the ingredients, with the possible exception of N-Acetyl L-Cysteine, are also well-studied and proven to improve endurance, energy, focus, strength and muscle growth. A downside is that Pre JYM isn't free from both natural and artificial flavorings. It also contains a relatively large 80 calories per dose. Pre JYM is surprisingly tasty. BCAAS are always going to add a sourness to the flavor, but this is offset by the artificial flavorings. In fact, some people may find the flavorings a bit too sweet despite the BCAAs. Taste is a personal preference though, so you won't know until you try it. There are also plenty of flavors available. These include Black Cherry, Cherry Lemonade, Orange Mango, Island Punch and Strawberry Kiwi. A single serving of Pre JYM (one scoop) contains 26g of pre-workout. This is a relatively large scoop, but is to be expected when you have lots of ingredients in high doses. You should take Pre JYM around 45-minutes before your workout. This provides enough time for the caffeine and other ingredients to take effect. As with all pre-workouts, I recommend starting with half the standard dose to test your tolerance levels. If you don't notice any side-effects, you can try the full dose for your next workout. The high caffeine dose in Pre JYM means you need to be careful about drinking other caffeinated drinks. Taking over 400mg of caffeine per day may risk health issues, so combining Pre JYM with even one standard cup of coffee could take you close to this limit. So, we've established that Pre JYM has an excellent ingredient profile, but what benefits can it actually provide? Firstly, the combination of BCAAs, creatine and other ingredients effectively make this a 3-in-1 supplement. Most people who are serious about strength training take creatine anyway, so the 2000mg per dose reduces the amount you need to take separately. Many people also take BCAAs separately, but these are included with Pre JYM. Pre JYM contains several ingredients that increase nitric oxide production in high doses. These can make big difference to your workout, by increasing pump, muscle endurance and aerobic performance (click here to learn more about how pre-workouts work). It's worth noting that beta-alanine can cause a tingling side-effect in some people. This is harmless, but can be annoying. The fatigue-reducing effects of beta-alanine are usually worth it though. Despite the heavy dose of caffeine, Pre JYM doesn't seem to cause a major crash after your workout. The combination of caffeine and Alpha-GPC provides a smooth focus and helps get you through a tough workout. In short, this is an excellent pre-workout supplement that provides a clean and sustained boost in endurance, power, muscle growth and focus. As we mentioned, Pre JYM is one of the more expensive pre-workouts on the market. The price varies depending on the retailer, but at the time of writing it was being sold for $48.99 for 30 servings at BodyBuilding.com. This works out at $1.63 per serving. For comparison, most pre-workouts are in the $0.8-$1.20 range. The best pre-workout supplements always cost more because of the large doses though, so we think Pre JYM provides value for money - especially as you won't need to buy a separate BCAA supplement and can reduce your expenditure on creatine. As we make a point of saying in all our reviews, any preworkout supplement has the potential to cause side-effects. You should always discuss a new supplement with your doctor and start with a lower dose to test your tolerance. This is important for everyone, but vital if you have pre-existing conditions such as high or low blood pressure, are taking medication, have a sensitivity to caffeine or are pregnant. And, of course, of you notice any side-effects, you should stop using a supplement until you've spoken to your doctor. This includes symptoms such as shaking, dry mouth, headaches, upset stomach or sickness. Even so, the ingredients in Pre JYM have been well-studied and are unlikely to cause serious side effects. The biggest risk is probably due to the huge 300mg dose of caffeine. Everyone responds to caffeine differently, but people with low tolerance may suffer from nervousness, nausea, shaking and other side effects. You should avoid taking it in the evening as this can affect your sleep quality. Beta-alanine can also cause tingling in the skin. This is usually harmless - and may even provide a sense of urgency to your workout. Many people find this tingling annoying though. "Concerning California Residents: This product contains chemicals known to the State of California to cause cancer and birth defects or reproductive harm." This is legally required to be displayed on any supplements sold in California that "expose you to levels of one or more chemicals that may cause cancer or reproductive harm." There is a list of chemicals that require this warning, but businesses aren't required to say which is the reason for it. "Due to prop 65 I'm forced to list a cancer warning despite no ingredients in the product causing cancer. Its silly." We're no experts on nutritional law in California, but it appears many everyday products carry similar warnings (including some such as potato chips). It's up to you whether you think it's a risk taking the supplement though. It's usually a good idea to cycle pre-workout supplements for a week every 2-3 months. This helps to prevent building up a tolerance - especially to caffeine. We also recommend having at least one "caffeine-free" day per week and 1-2 days with low caffeine intake. 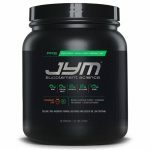 You can buy Pre JYM from a variety of retailers, including Amazon, GNC, BodyBuilding.com, Vitamin Shoppe and many others. JYM doesn't sell the product directly though. Post JYM is the company's post-workout supplement. It contains some of the same ingredients, such as betaine, taurine, BCAAs, creatine and beta-alanine, but doesn't have any caffeine. Ideally, you should combine Pre and Post JYM to gain maximum benefit. Pre JYM pre workout is still a great choice on its own though. JYM also produces a range of other supplements. These include Shred JYM (for fat loss), Mass JYM (for weight gain) and Alpha JYM (for testosterone support). N.O. Xplode is another popular pre-workout supplement. But how does it compare to Pre JYM? In short, Pre JYM is the superior pre-workout. While N.O. Xplode has more ingredients, it features the dreaded "proprietary blends" so it's impossible to know the dose of each ingredient. Considering the "Alpha Fusion" blend totals only 1000mg and includes citrulline malate, folic acid and various extracts, the doses also aren't clinically backed (for comparison Pre JYM contains 6000mg of just citrulline). The only advantage of N.O. Xplode is that it's cheaper - but even then, there are plenty of better PWOs out there for similar prices. The C4 series of pre-workouts is arguably the most popular of all time, so it's interesting to compare the Ultimate version with Pre JYM. Both workouts are similarly priced, and the comparison is much closer than with N.O. Xplode. C4 Ultimate matches Pre JYM's generous 6000mg of Citrulline and 300g of caffeine, plus has a larger 3200mg dose of beta-alanine. Unfortunately, C4 Ultimate has a proprietary "Energy and Focus Blend." This contains 300mg of caffeine, but undisclosed amounts of Alpha-GPC, L-Tyrosine, Huperzine A and various other ingredients. For this reason, we prefer Pre JYM. As you've probably guessed by the tone of this review, we're big fans of Pre JYM pre workout. It's one of the most well-rounded pre-workouts on the market, due to its generous doses and wide range of scientifically backed ingredients. The biggest drawback is the price. This is an expensive pre-workout - and the cost can start to add up if you want to take it before every gym session. We also think it could do with a bigger dose of betaine and the addition of L-theanine. Even with these minor issues, Pre JYM provides excellent value and is amongst the top pre-workouts for energy, strength and performance. It's certainly up there with 4Gauge and Transparent Labs PreSeries BULK on our list of the best PWOs. If you're looking for a science-backed and transparent pre workout, we don't think you'll be disappointed. 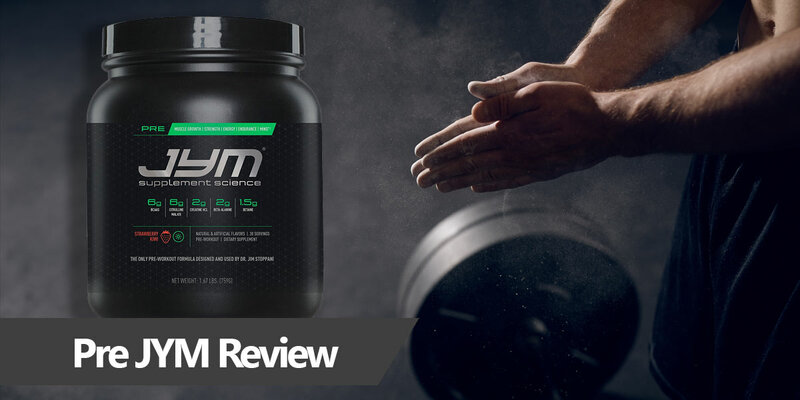 We hope this Pre JYM pre workout review has helped you decide whether it's the right supplement for your goals and budget. If you have any questions, comments or feedback, let us know in the comments section.